Beef, green beans, and potatoes come together in a savory pie that is sure to satisfy the whole family. Prepare Mashed Potatoes*; set aside. In a large skillet cook meat and onion until meat is brown and onion is tender. Drain off fat. Add the salt and pepper. 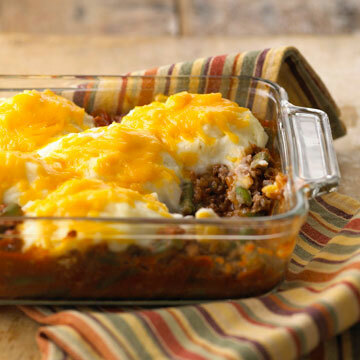 Stir in thawed beans and soup; pour into a greased 2-quart rectangular baking dish or casserole. Spoon Mashed Potatoes in mounds on bean mixture (or, if desired, pipe potatoes using a pastry bag and a large star tip). Sprinkle cheese over the potatoes. Bake, uncovered, in a 350 degree F oven for 30 to 35 minutes or until mixture is bubbly and cheese begins to brown. Makes 6 servings. *Three Mashed Potato Options: 1. Use four servings refrigerated mashed potatoes. *Three Mashed Potato Options: 2. Prepare 4 servings instant mashed potatoes according to package directions, except reserve the milk. Add egg and season to taste with salt and pepper. Add enough reserved milk so potatoes are stiff enough to hold their shape. *Three Mashed Potato Options: 3. Make mashed potatoes using 5 medium potatoes.